Yes, it’s official! News this month confirms it’s cheaper to own a home and pay mortgage repayments than to rent. Research from Santander Mortgages reports potential first-time buyers could save in the region of £2,268 a year if they were able to purchase a property over renting. The cost of renting now outweighs that of monthly mortgage repayments by an average of £189 a month with average rents at £912 per household, compared to £723 for repayments. Many would argue it’s been a long time coming, especially those who desperately want to own their own home and get on the housing ladder. But, despite the average deposit for a home being double the size of ten years ago, last year saw the number of first-time buyers hit the highest level in a decade. The figures from UK Finance, the trade body for Britain’s banks show a total of 365,000 buyers took ownership of their first home in 2017, an increase of 7.4% compared to 2016 and the highest number since 2006. Those first-time buyers faced with months, even years of saving to get their first home can now breathe a little easier thanks to the Government’s announcement in the recent Autumn budget, to scrap Stamp Duty on homes less than £300,00, for those buying their first home. Strata is an established home builder, building stunning new homes at developments across affordable Yorkshire and Midlands regions, including areas like Leeds, Hull, Wakefield, Leicester and Burton on Trent. Strata’s love of design, unrivalled attention to detail and high-quality specification comes through each house and street scene they create, while customer experience is engrained in all they do. With a forward-thinking philosophy and continually striving to the best on the market, a new home from Strata should definitely be considered. Recent news reports the Government will struggle to meet its housebuilding target due to a severe shortage of skilled construction workers. And the situation for the construction industry is predicted to worsen once Britain leaves the European Union, as many of the current skilled workers are from EU countries. It’s not a new problem within the industry and certainly hasn’t come about due to Brexit alone. In fact, the skills shortage has been noted for some time due to an ageing workforce and a lack of new entrants to the market. 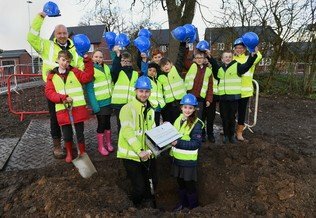 Housebuilder Lioncourt Homes invited pupils from Windsor Park Middle School to bury a time capsule in an area of open space at their Barley Fields development in Uttoxeter. The school children aged seven to eleven were challenged to collect a range of items that will give future generations a sense of what life was like in 2018. Photographs and drawings of the pupils along with write ups about school life, a stamp and a picture of the queen were among the many memorable items included in the time capsule. Will the Government hit their new homes target? Some said it was always a very ambitious target, and data made public at the beginning of this month goes to confirm that, with figures from the Ministry for Housing, Communities and Local Government showing the Government will fall short of reaching its 1 million new homes target by 2020. Changes are on the way to make conveyancing simpler, faster and cheaper with the introduction of digital services. If you’ve entered in to our prize draw competition please see terms and conditions below. Following overwhelming response from the public, the Government confirmed the ban of the sale of new-build leasehold homes in July last year, requiring developers to re-evaluate leasehold agreements.